We took the keys on April 30th, 2014 and started renovating on May 1st. But the garage saw no love until July 26th. Understandably so because we did a lot inside the house. That July two friends came over to help build a workbench based on something I sketched out. 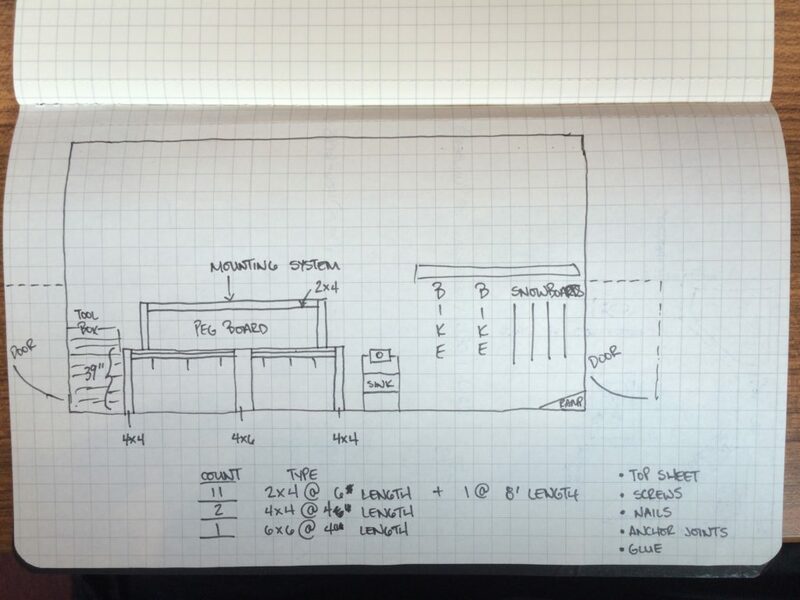 Super specific and professional sketch of the workbench. I should have been an architect…right! Pretty cool huh! I just married some drywall and then painted it blue with a leftover gallon from painting another room. 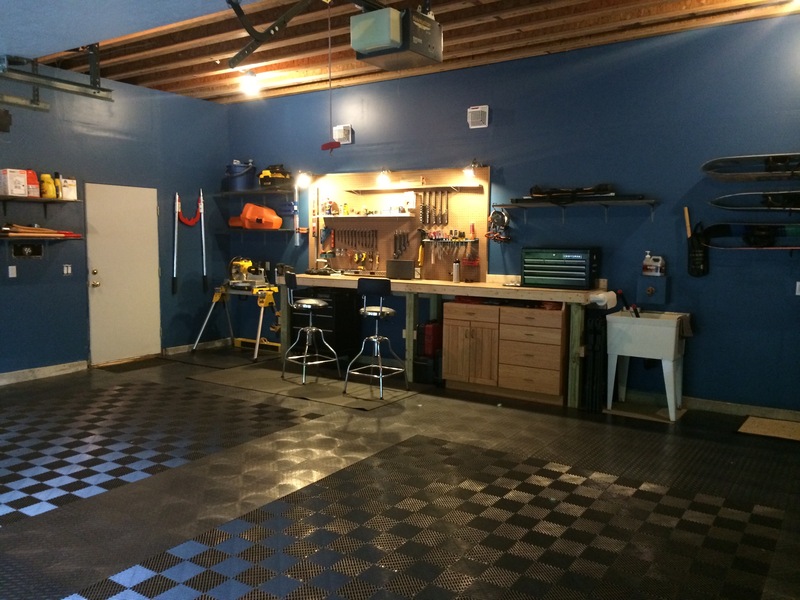 The flooring is made by a company called RaceDeck and it is excellent! Highly recommend this flooring. At the time I didn’t know I was going to get into woodworking and wish I had not invested so heavily in the “grated” tiles. At the time I was thinking it would catch the road grime off our parked cars and be an easy cleanup. It turns out the flat tiles are incredibly easy to clean while the “grated” tiles just catch the mess and require a lot more work to clean. They look cool, but functionality is not as convenient. Oh, and the woodworking portion (will cover a bit more) creates a lot of sawdust. That just falls into the “grates” and never escapes. The following winter Jess knocked a side view mirror off my car while backing into the garage and decided she did not want to use the garage anymore. In the fall I had acquired a number of mobile yard machines: wood splitter, chipper, etc that I was using to clean up the backyard. During the winter I was storing them in my garage spot, so my car was also staying outside. 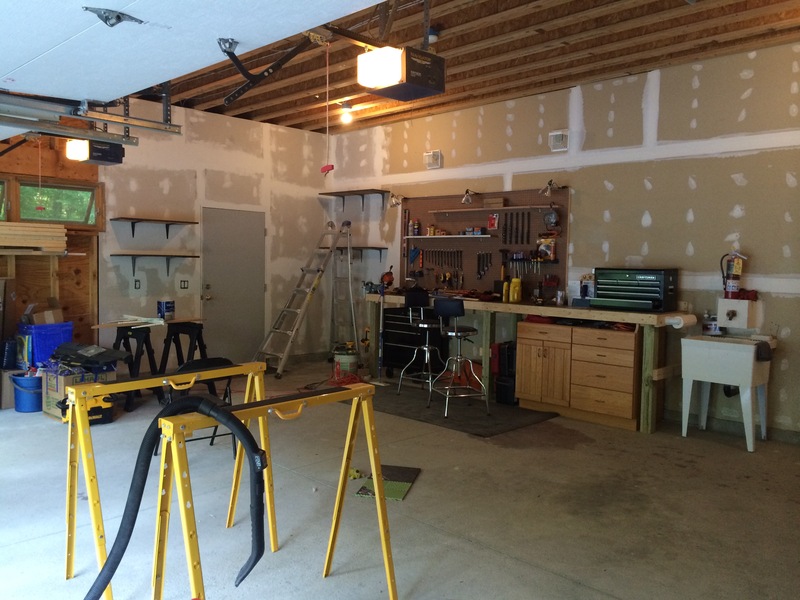 The garage was becoming a “workroom” and “storage shed” moreso than a car spot. By the Summer of 2015 I was significantly upping my woodsman game. Progress in the backyard was amazing and our firewood needs (plus donations for a number of families) was easily being met solely on storm damage. It was keeping me busy. And the garage was the headquarters for all operations. But I was getting tired of making 12 cords of firewood per year. We only burn about 1 to 2 cords and the rest was being donated or raising our growing pile out in the woods. In one year I had made enough to cover us for the next 5 years. So, I got a saw mill. 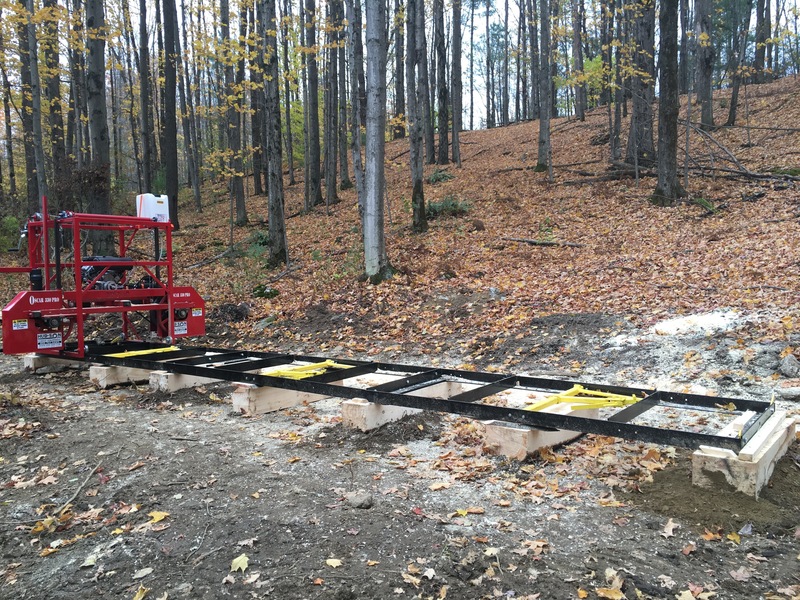 There was a natural clearing where it looks like some construction equipment might have worked along with some old log piles from when the house was built that has become my lumber processing area. It is also serving as good storage for the machinery I was storing in the garage. 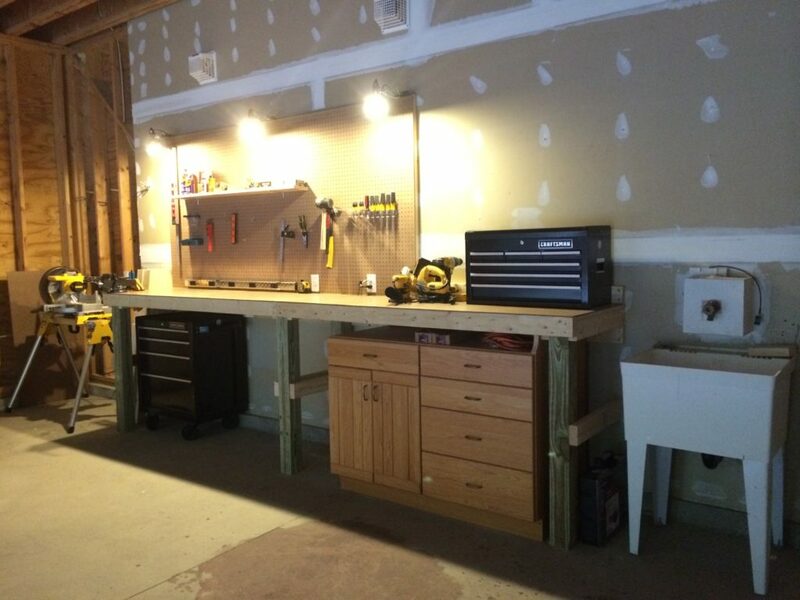 Now I have a garage for woodworking! Let’s call this point Garage 2.0 as it is now churning out useful stuff instead of just playing the storage role. We can still use it to park a car, but neither of us have an interest in doing that over the frames, furniture, and other cool things we’re producing for the house. 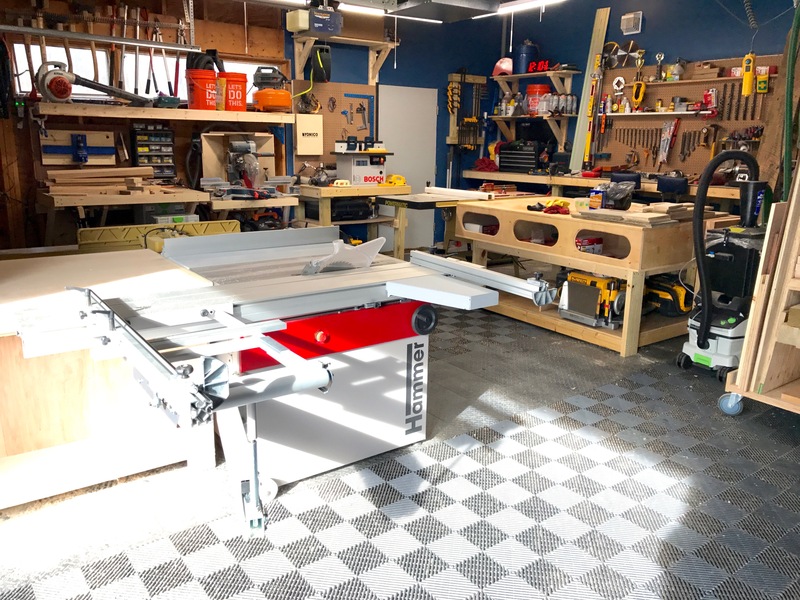 With the addition of the Hammer K3 sliding table saw, Powermatic jointer, and a Rikon bandsaw (not pictured) the garage is a little cramped. 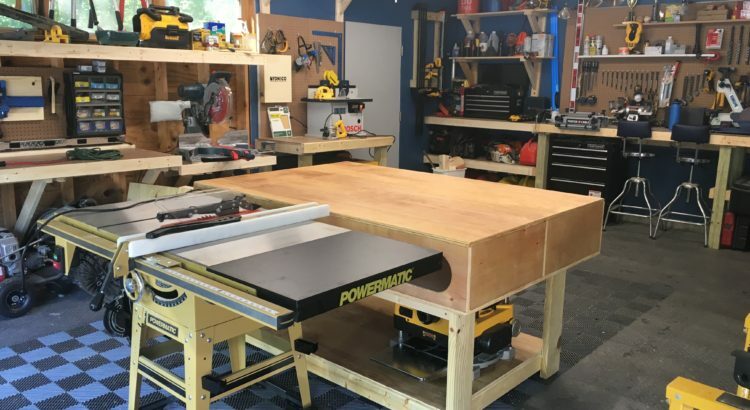 I’m trying to sell the Powermatic table saw to pick up a little more working space. But the sliding table saw is a MUCH safer machine to operate as long as one sticks with using the slider appropriately. And that was the sacrifice: space for safety. 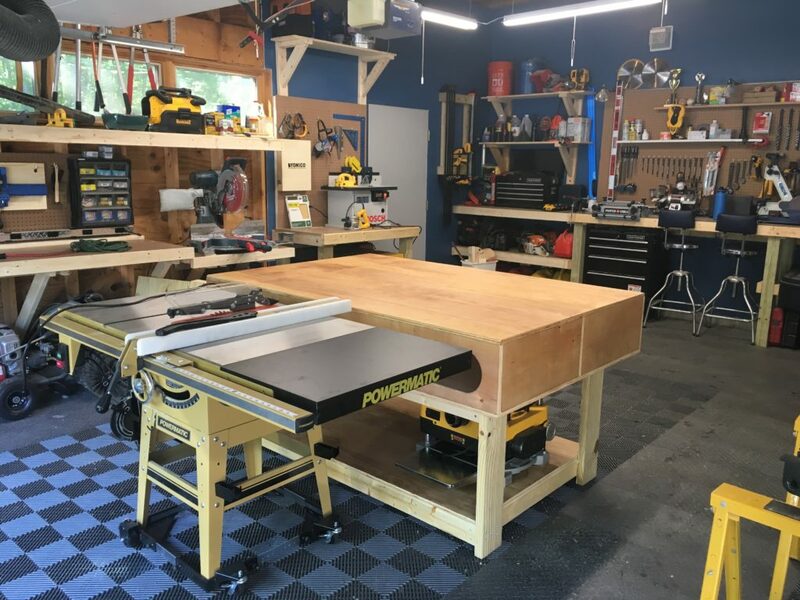 This is Garage 2.5 and the plans for 3.0 are to build cabinets for the miter saw making a proper miter saw station that will house some of the loose tools leaning on walls and stuff like that. 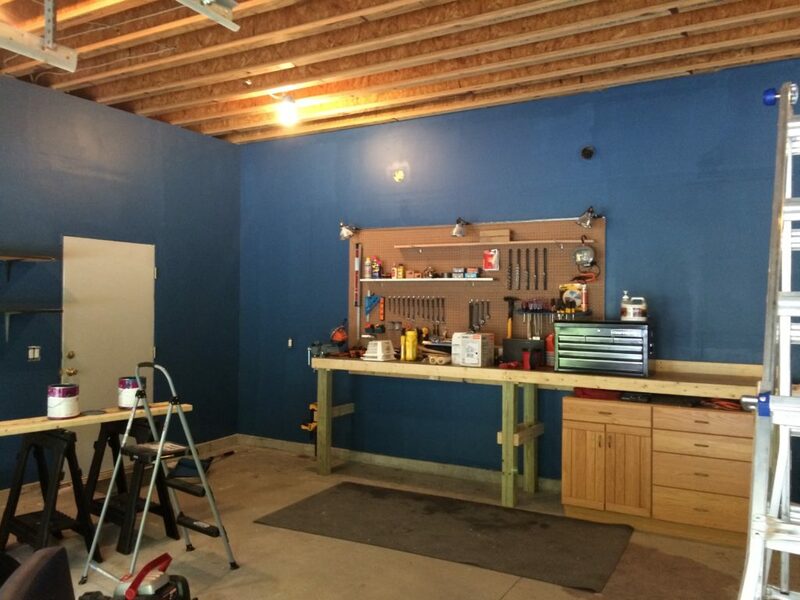 I have a feeling Garage 6.0 is going to be more like detached Woodshop 1.0 across the driveway. But that’s another story for another year. Lighting is provided by Lithonia through Home Depot. They’re your 2700k (warm) LED ceiling lights that are like $20 per light. Easy to install, daisy chain together, and make plenty of light! 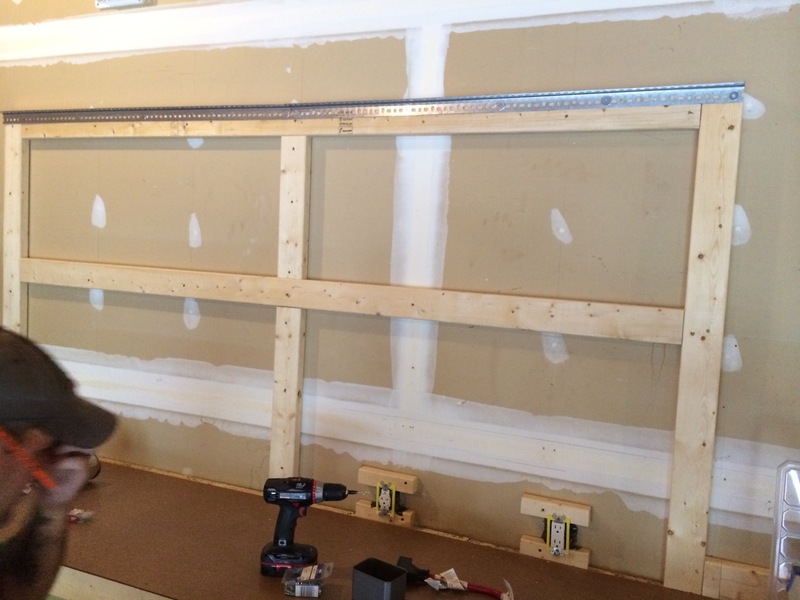 We recently contracted Peck Electric to snag an open slot on our main electric panel to run a 60 watt subpanel into the garage. 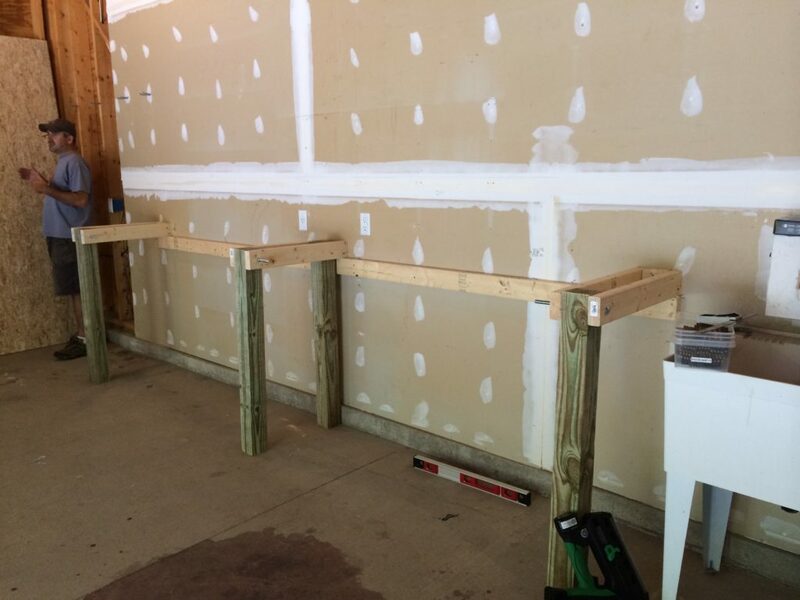 We now have four 220 volt outlets and separated the breakers for two of the garage wall’s 110 volt outlets. So, the lights run on their own breaker, the miter station wall on it’s own breaker, the security cameras are on their own breaker, and the back wall with the original workbench is on it’s own breaker. And with the additional 220 volt outlets each having it’s own breaker the larger tools won’t be fighting for power resources like they used to. I was getting tired of running down to the electric panel to throw a breaker because I forgot to turn off 1 tool while making a quick cut. It was typically the air compressor coming back on while I was running the table saw and those are two tools I use in short bursts constantly. Now, 60 watts doesn’t sound like much, but I’m a one-man operation who could not possibly run every machine at the same time. If this were a commercial environment 60 certainly wouldn’t be enough. Dust collection is pretty manual. 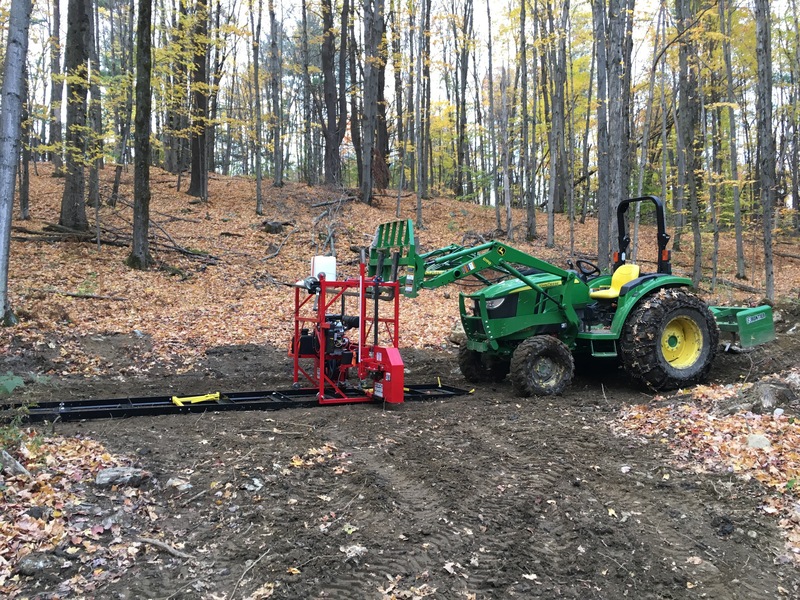 It is handled by a Powermatic 2 micron machine with two 4″ hoses. One hose stays on the table saw all the time while the other hose is shared between the bandsaw, jointer, and planer with Rockler’s Dust Right kit. I have to move the hose between the machines. It isn’t that big a deal. The miter saw and router table share a Rigid shop vacuum with a Hepa filter and the rest of my tools are compatible with the Festool vacuum system. Air filtration is handled by a Powertec system hanging between the lights in the ceiling.